You can help Rescate and have fun doing it by participating in the President’s Cup tournament, which takes place on Saturday, January 26 and Sunday, January 27. 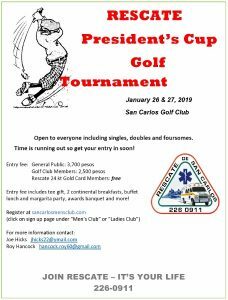 The tournament is a major fundraiser for Rescate and a highlight of the season for San Carlos golfers. Rescate de San Carlos provides 24/7 emergency medical care for San Carlos and the surrounding area. It is a vital community service funded entirely through donations and fundraisers like this golf tournament. Sign up at sancarlosmensclub.com (click on sign up pages under “Men’s Club” or “Ladies Club”). Open to everyone, including singles, doubles and foursomes. Time is running out so get your entry in soon. Cost: Golf club member: 2500 pesos. Non-member:3700 pesos. FREE for 24K Rescate Gold Card holders. Includes: tee gift, 2 continental breakfasts, buffet lunch and margarita party, awards banquet and more! 5:00pm: Awards Banquet at San Carlos Yacht Club. Cocktails start at 5:00pm and dinner is at 5:30pm.